The Mass Communications Research Center (TK) was a special institute in pre-transition Hungary, and unique among Soviet bloc countries. It was established in 1969 primarily as a media and public research institute and, over the years, came to deal mostly with economic and political public opinion research. The institute, which later operated under the name Hungarian Public Opinion Research Institute (MKI), was closed without a legal successor by the first democratically elected government in 1991. 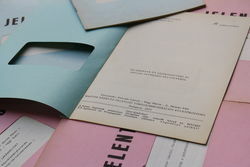 The invaluable research material, documentation and specialist library that remained were taken over by the MTA-ELTE Communication Theory Research Group, formed with the assistance of the then president of the MTA (Hungarian Academy of Sciences).This research group was permanently closed by the government in 2010. A significant part of the TK’s documentation and data legacy has survived in copy format, and this collection has been donated to OSA by the researcher Mária Vásárhelyi and other professionals. OSA has processed and made available a large part of the material and, with the help of external experts, reconstructed and digitized the data collection. On April 29, 2013, OSA is holding a public conference at which representatives of the profession will evaluate the significance of the TK, and discuss how data on pre-transition public thought are already becoming researchable for the broader profession, thus opening the way for long-term comparisons and analyses. The conference will be in Hungarian. Download the program of the conference.